Celebrate innovative design and engineering with this amazing LEGO® Technic model. Developed in partnership with BMW, this detailed replica captures the unmistakable, iconic lines of the real-life machine and features a blue and black color scheme, handlebar steering, BMW Motorrad's unique telelever front suspension system, aerodynamic windshield and a detailed dashboard and exhaust. Raise the kickstand and maneuver the motorcycle to see the visible shaft drive and two-cylinder boxer engine spring to life. Large top case and luggage panniers with opening lids, and black spoke wheels with all-terrain tires add the final touches to this magnificent model! Rebuilds into a unique concept model, created in collaboration with BMW designers. Interactive, 3D digital LEGO® Building Instructions app available online, for both models! Price is 18% below the initial Lego retail price, a € 10.04 discount! This comes down to 7.45 cent per brick. The BMW R 1200 GS Adventure (42063) Lego set is available from the sites below. However, they do not offer delivery to your selected region. 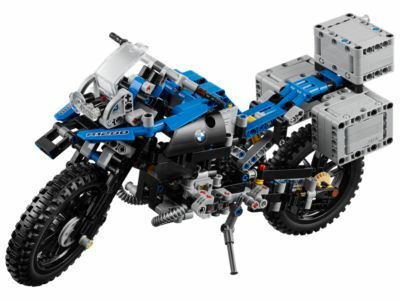 The BMW R 1200 GS Adventure (42063) Lego set is no longer directly available from the sites below. However, 3rd party partners of these sites might still have the set available. Alternate description Experience the BMW R 1200 GS Adventure! Interactive, 3D digital LEGO® Building Instructions app available online for both A and B models.